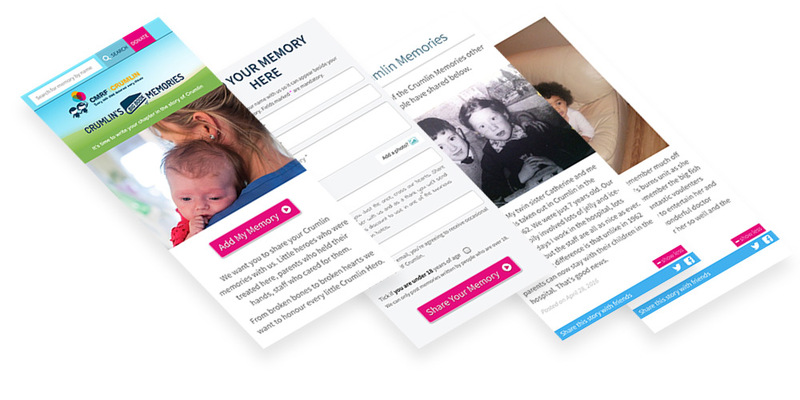 We have a special affinity with the third sector, so when our friends at Ask Direct – one of Ireland’s top fundraising & direct marketing agencies – asked us to develop the user experience and visual design for the Crumlin Memories microsite, we jumped at the chance. Just like the diverse teams of professionals working tirelessly to save and improve lives at Our Lady’s Children’s Hospital, Ask brought us together with social media and web development experts to plan, create and promote the microsite. Of course, we played a significant part in the project ensuring the experience and design seamlessly supported the campaign goals. Working within CMRF’s existing brand guidelines, we needed a way to separate the campaign from their main site. So as part of the design process, we created the Crumlin’s Big Book of Memories campaign logo. Post-launch, we continued to remain involved with suggestions for iterative improvements to the site based on research into site analytics and audience behaviour. And we’re delighted that the project won Silver in the 2017 AnPost Smart Marketing Industry Impact Award (Fundraising Category). Visit the Crumlin Memories microsite. Read how we designed and built a promotional website for a singer-songwriter.